I would like to make a 6 or 8 buttons remote control (to control some lights and scenes) with NRF24 or RFM69 and be a battery powered node. Is there a clever way to handle interrupts on all the pins besides the usual 2 and 3? I had the same thought, I just wanted to ask for other viable options. How is the power usage of the mpr121? I wonder if this would do what Gohan has in mind? Looks as though it needs just one analog pin to read the voltage and thereby infer which button was pressed. With luck, maybe all the voltages would be high enough to trigger the interrupt. Button Keypad 3x4 module. One analog out. Compatible for Arduino, Raspberry, STM. It's a voltage divider. Structured like this, it could trigger the IRQ pin when a button is pushed, and the analog pin could read the voltage to determine which button it was. @neverdie I know, it is similar to the arduino examples for the classic flat numeric keypad, the problem would be how to trigger the interrupt to wake the mcu. the problem would be how to trigger the interrupt to wake the mcu. What problem? You trigger on the rising edge. The other benefit is that it consumes no power unless a button is pushed. Well, on an arduino, you could wire it to both the IRQ pin and an analog pin (see above schematic). On an nRF52832, you'd need only one pin. Would it still be able to trigger interrupt even with all those resistors? Try it. 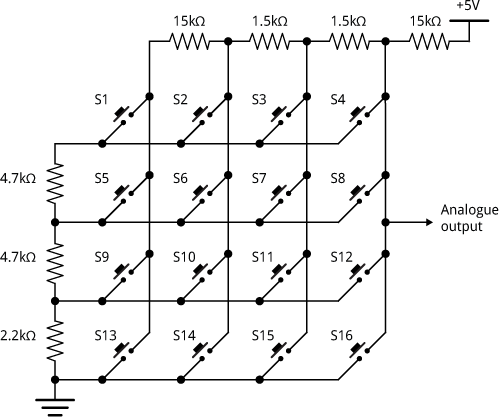 I don't see a problem with it, but if it were a problem, you'd just reduce all the resistor values proportionately. The nice thing is that since you'd be measuring the voltage relative to the voltage powering your arduino/mcu, even if the battery voltage were to decrease, you'd still get the correct value for the button pressed. On an nRF52832, you'd need only one pin. Slightly off topic question. On the nRF5's, can any pin act as an interrupt? IIRC, any GPIO can. I can't think of any exceptions. So, notionally, you would wake from the interrupt pin, then change it to be an analog pin and read the voltage from that. Cool! I didn't know there was an official Arduino keypad. // interrupts are turned on. The pro mini sleeps until one of the buttons gets pressed, then it wakes up, reads the value, displays the value, and then goes back to sleep. It * might* get a little hairy though if running at 1.8v and you've got a lot of buttons to disambiguate and you still want to wake up on any button press. According to Table 32-2 of the atmega328p datasheet, the minimum threshold for input HIGH if running at vcc=1.8v-2.4v is 0.7Vcc. So, at the limit, that is 0.7*1.8v=1.26v. So, if n is the number of buttons, you need to disambiguate, then in a perfect world 0.54/(n-1) volts separates each button press. So, if say 12 buttons, that is 0.54/11=0.049 volts. Well, let's see: resolution is 1.8v/1023=0.0018v. Hmm... Again, in a perfect world, that's 27 analog read units separating each button press. In an imperfect world, that's not a lot of headroom for disambiguation. I guess in the worst case you might have to run a one-time calibration for each button and store it in EEPROM. I would hope to avoid such a calibration step, but it might come to that. I am planning to use a LiFePO4 3.4V battery anyway, so it will be difficult to go even below 2.8V as that would mean battery almost empty. @neverdie Is this not an instance where a high efficiency low dropout booster supply would null this particular issue? Yes, that trade-off would relax the constraints. But so does a one-time calibration. Since writing the above, I've warmed up to the idea. At least for my purposes, it's not that big a deal. What about resistance variation due to temperature changes ? I hadn't really thought about that. Should I? In my case (12 buttons on a remote control) I'm assuming the resistors stay more or less room temperature. It would depend on the quality of your resistors, and if your room temperature varies. Cheap carbon film resistors can have relatively wide temperature coefficient variation range, I see over 1000ppm/°C between min and max of range for some "branded" resistors on Arrow.com so it could be worse with cheap aliexpress versions. So if you're unlucky you could get resistors in the two opposite parts of the range. With 27 units on average on a 1024 max value you have an average 27000ppm margin, so you should be ok if your keyboard stays inside, but it could become a problem if it's outside, a 30°C variation between summer and winter could in theory give your wrong results. Since values are a bit far apart, I could make a range of values to be considered a specific key pressed. @gohan Does the Arduino keypad that you already have work on the same principle? Presently I'm doing the layout on a 3x4 matrix keypad that uses fewer resistors (using the design I referenced earlier), but which works on the same voltage dividing principle. I have the same use case (remote control with buttons to control lights/scenes). Not sure if I'll receive the codes via MySensors, or write something that talks directly to the controller (thoughts on pros/cons of each approach welcome). Of course this won't be as reliable or flexible as buttons connected to a MySensors node, but it should be enough for my needs. I think you should change the remote controls into MySensors nodes. A bit more work at the beginning but you'll probably save a lot of hair pulling, reliability etc in the long term. You can use pin change interrupts with MySensors sleep loops with an easy hack. Here's the code I use for 4 button battery powered nodes that also report temperature and humidity using DHT a sensor. I run them from 2 AA and so far they've been running for more than 6 months without showing signs of discharge. This could be easily modified for 6 or 8 buttons. @carywin Certain arduinos such as the pro minis can ONLY do interrupts on pins 2 or 3 from my understanding. @carywin what is the sleep current of your node with this "interrupt hack"? The whole thing fits on a single sided PCB. IIRC, you can do interrupts from other pins too, but each is tied to a separate bank of pins, so you have to do additional testing to determine which specific pin triggered the interrupt. In the case of the voltage divider keypad, that should be no problem. Here's a revision of the earlier code so that it uses ONLY ONE PIN (namely, A0) on the Arduino. And yes, this does work on a pro mini too, because that's what I tested it on. //  Use just A0 to process the 12 button keypad. //  Button press is detected by interrupt set on A0. //  Which button was pressed is determined by an analog read of A0. //no need to do anything beyond just waking up. How does that integrates with mysensors? @neverdie well... kind of... I haven't written mysensors' core so I don't know if it will clash with normal sleep management. @wes Maybe your resistors don't have a high enough power rating for the current that's running through them? i.e. holding down the button heats them up and therefore changes their resistance? That might explain the slowness to react as expected after the button is released. After release, they cool off and eventually return within their expected resistance tolerance, at which point the expected behavior finally happens. @NeverDie do you think a NRF5x would be better solution to make a small compact remote control? @gohan It's hard to answer a question like that in a vacuum, but in general, I do like nRF5x better than nRF24L01 beause of nRF5x's better link budget. I also like LoRa because of its great range and coverage. I have made remotes using each (and I have made posts about them), and they each have their place. did you post the nrf5x remote in the nrf5x topic or did you made a new one? @gohan It was on the nRF5 action! thread and for LoRa it was on the CNC thread.